How Long Does Red Wine Last? It’s easy enough to answer the question ‘how long does red wine last once opened?’ which is very different thing to how long a wine will last in the bottle. A quick Google search will tell you that an open wine can last up to a week if you don’t do anything silly like leave the cork out or prop it against a south-facing window. How long a wine lasts when open comes down to how much oxygen is in contact with the wine and for how long for. When talking about a vintage, you’re essentially talking about the weather. The weather massively impacts the potential of how long a wine can last. Put simply: the less rainfall during the harvest, the less water diluting the grapes, which prevents the grapes from maximising all of their full potential and intensifying their flavour. Big bold wines with lots of tannin and acidity such as a Cabernet Sauvignon for example benefit from being decanted allowing oxygen contact to the wine. This is needed with wines which tend to have a lot of tannin and acidity to allow their aromas and flavours to develop and give the chance for the wine to open up and become its best. The deeper question of how long red wine actually lasts over the years in the bottle, and how it matures, ages and improves, is somewhat more complex. At The London Wine Cellar our extensive list of wines are at all different stages. They are either in the early developing window, improving with age or are currently at their peak drinking window. In order to investigate a wine’s potential there’s a few different factors which need to be taken into account. A higher level of acidity is preferable because acidity naturally lessens over time and the wine sheds away a lot of its baby fat and becomes a more wholesome wine where all the elements come to together and balance out. Structure refers to the properties of any given wine, specifically its sweetness, acidity, tannin and its alcohol level. Particularly Sugar plays a role as being a natural preservative it doesn’t just add sweetness but also gives the wines with ageing potential. Alcohol level can also give you a clue as to a wine’s likelihood to slip gracefully into old age: You want to go for either low or high levels. Curiously, moderate alcohol levels can actually cause wine to break down, whereas high levels work well to protect dry or fortified reds and low levels avoid spoilage in other bottles. Tannins, or polyphenols as they’re also known, should not be forgotten either. Tannins stabilise the characteristics of a wine, like for example its colour and taste, so you need at least moderate levels for a wine to develop beautifully over time without spoiling. The Producer, I know we’re always going on about this, but that’s because it’s vital: do your research before you invest in a wine. A producer may seem impressive and you may be seduced by their PR, but you have no idea whether their wine will make a good investment until you’ve really dug into their past. How long have they been established? Do they have a history of producing saleable vintages? Most importantly, perhaps, do they demonstrate a scientific understanding of the ageing process of wine that reassures you their wine will not only last but mature into something stunning? Market, It is important to note that regardless of the factors above, the market for a particular wine is vitally important to take into account. Look at wine buying trends over the years — what is enduringly popular? What always seems to retain its market value no matter what? Sweet ports may age well, for example, but the demand for dry reds from Bordeaux, Italy, Napa Valley, Burgundy is far higher, since they’re so utterly delicious to drink at any occasion. 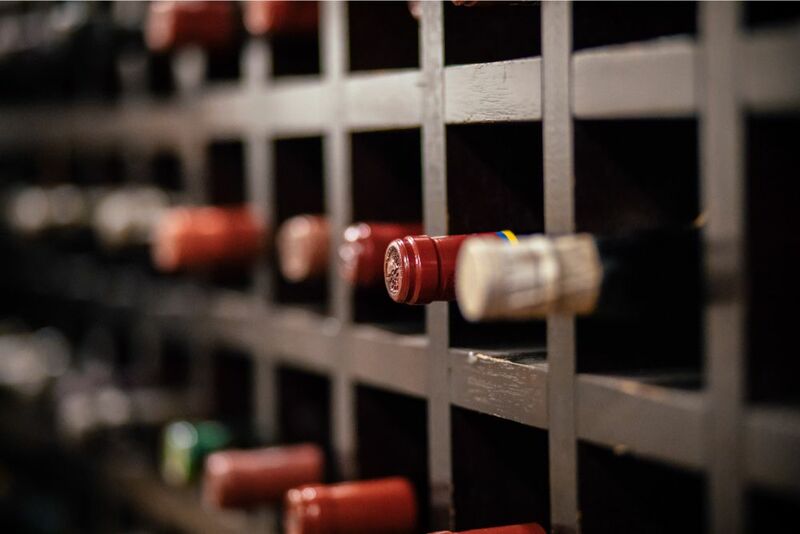 Storing your red wine, whatever wine you decide to pin your hopes on, you should follow basic guidelines for storage: We like to think of red wine as vampiric in nature: it prefers to be stored horizontally, in a dark space and never ever in direct sunlight. Though it won’t crumble to dust in the sunlight, direct light and overly warm temperatures are a recipe for oxidisation. Try not to store your fine wine with foodstuffs for long periods of times; it is an organic product stored under a natural stopper and it breathes and absorbs smells, so storing it with strong smelling food could actually lead to some rather odd-tasting bottles. Make sure that wherever you choose to store your wine it enjoys a stable temperature. Around 10–13˚c would be spot on, but whatever the temperature, keeping it consistent is key to avoiding the dreaded oxidisation process. We know you probably weren’t thinking of storing your wine in the bathroom cabinet, but just in case, it’s worth mentioning that fluctuation in humidity is not what you want. Humidity should be nice and high: anything below 70% can encourage the corks to dry out stopping them forming an effective seal on the wine, therefore allowing oxygen into the bottle and spoiling its contents over time. Never fear a mouldy cork – this is a sure sign of a nice cold, damp english cellar! Although it may be tempting to take your bottles out of storage every now and then to admire them, try you best not to! Movement and disturbing the sediment will affect the flavour of your wine, so you want to keep it as still as possible. Providing you are well advised and you store your collection properly there is no reason why your fine wines, especially the red’s, could not age beautifully for 75 years+. Ok, so you’ve worked out what wines are likely to accrue value and you know how to store them. What next? To build a really killer portfolio of fine wine, you should aim to set aside around £5,000 to start, but even if you only plan on buying one or two cases, always get expert advice and double check quoted prices and company reputations using respected online search tools – www.wine-searcher.com is a good place to start. Our sister merchant www.hewines.com are very well placed to advise on investment cases to tuck away. As with any serious investment, try to spread your risk by buying different varietals of wine and from different regions, and remember to never ever spend more than you can afford to lose. You should also be prepared to spend a lot of time twiddling your thumbs: fine wine investment is a long game. You’ll probably need to wait between 7 and 10 years before the value of your fine wines have sufficiently increased to sell. Selling online with any automated valuation sites, these lead to disappointment. Using auctions, their dinosaur like commissions and randomness of the market make it difficult to achieve a fair market price. Instead sell to experts with an excellent track record and reputation in the industry. At The London Wine Cellar we are proud of our five-star Google Rating and warm recommendations from all previous clients. We make the selling process simple: it’s easy to get a competitive, obligation-free quote; we provide specialist wine couriers to pick up your goods; and we offer super fast payment as soon as your goods have been quality checked. To get a quote or even just chat with our friendly in-house team, get in touch via our quick online form, give us a call on on 020 7377 8097, send us a message through WhatsApp feature (07920 442230) or just drop by our peaceful London cellar.